As teachers we have so many things vying for our attention at every moment. A distressing email from a parent, a student who needs help with his homework, and of course – that monstrous pile of grading that’s sitting on our desk. And while all these tasks feel incredibly urgent, not all of them are actually that important. We teachers tend to run from task to task, as it always feels like we’re trying to squeeze 30 hours of work into a 24-hour day. But if we want to make the biggest impact and also keep our own sanity, we need to focus on what’s truly important. If this concept is new to you, take a second and read this great article explaining the difference. I remember sitting in a faculty meeting during a particularly hectic week when my principal discussed this principle with us. It really hit home with me because I tend to be a list person, someone who wants to get as many tasks done as possible. But if I’m not careful, my busyness causes me to miss things that are more important, such as the opportunity to counsel a student who is hurting or the chance to really get to the heart of a discipline issue. The next day I got out my computer and printed out a little sign that said: “Do what is important, not necessarily what’s urgent.” I posted it right next to my desk where I could see it every day. Where it would remind me to look beyond the pile of papers and see the students – yes, the reason I’m teaching in the first place. You see, we tend to get so bogged down in our lesson plans, our grading, the Common Core requirements, and the paperwork. But while of course we have to do these things, they’re not what’s really important. The kids are. The parents are. Our fellow teachers are. The people in our lives are what matter most, and our relationships with them are what will truly make a lasting impact. We can teach kids math and science and history and language, but we all know that the impact we make on their character and on their hearts goes much further than the knowledge we try to cram in their brains. How many times have we missed an opportunity to make a real difference because we were too engrossed in our own list of urgent-but-not-so-important tasks? I know I’ve done this too many times – and I bet I’m not the only one. So what do we do? 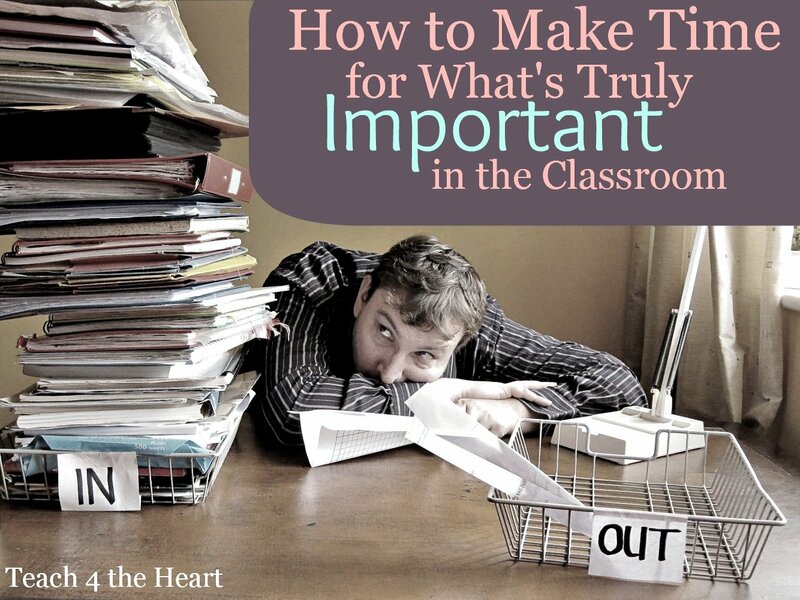 It’s easy to say we need to focus on what’s important, but how do we actually make that happen amidst the craziness and busyness that we call a day of teaching? I have a few quick thoughts…. Put important-but-not-urgent tasks on your to-do list. Is there a student you know could benefit from a heart-to-heart? Put it on your to-do list? Do you need to counsel some students who have been fighting? Put it on your schedule. Having trouble finding time to exercise or for personal devotions? Schedule it. Find ways to save time on the urgent-by-not-important tasks. There’s no doubt that the grading has to get done and the lesson plans have to be finished, but the more time we can save on these tasks, the more we have for things that are more important. Check out my series 25 Ways to Save Time & Take Less Work Home for my best time-saving tips. Pray for help. Speaking of things that are important but not urgent, prayer could certainly top that list! We need to seek God and His wisdom and ask Him to help us notice and choice the things that are important. Seek accountability. Of course we can work on this area on our own, but how much more powerful is it to take a fellow teacher, spouse, or friend along for the journey! Having someone else to remind us of our priorities and with which we can share our struggles and successes can be the difference between a goal that peters out after a few weeks and one that changes our lives. What do you consider to be extremely important in your life? How do you focus on what is important when so many urgent things clamor for your attention? Thank you so much for these awesome words!! I really needed to hear this today.